Now a problem that I see from at least the last 3-4 people asking advice, if you level up and skill up all your heroes the game will match you against opponents based on your best 5. For instance in your case you have a 3 star soulhunter, 3 star warrior monk, 2 star savage one, 2 star cleric and 2 star admiral. You will never do crusade with those 5 heroes all at once, but the game will match you against stronger opponents because those heroes you've upgraded are high power level. So now any time you use your 1/2 star heroes in crusade you will feel much weaker than your opponents. Yeah I did, therefor I started leveling my chaplain. Only got 19/10/1 in skills on her though, guess I should max out the 3rd and get 30'ish in first? Also, should I hire a DK or try with my Warrior monk? Max 1st and 3rd skills, don't bother with 2nd skill on chaplain. I think Death Knight is the best for crusade so if you can find a Death Knight merc same level I recommend using it. I'm guessing your top 5 aren't max skills because of this. You need to focus more purely on 5-6 and not all your heroes. Your line up is fine if you sub out Emberstar for Chaplain. (Warrior Monk, Lightning Master, Ice Mage, Commando, Chaplain). In this days I have changed a few things in 1 of my account. In other account I had no time: so no changes. Or its badluck for me in all of my accounts or the opponent matching formula has been updated and is not valid what it was a few weeks ago. A few weeks ago: around level 32-35 I just hired a level 37+ tank, maybe lvl 39 and it was easy 15/15 clear. Now it isn't working. Around lvl 44-48 I could clear or do 13/15 in most case with 3 dps +2 support + 2 tank + 1 mercenary. Now it isn't working that tactics. Stage 2 opponents depends on stage 1 hero used. It is easier than stage 3, but for me stage 2 wiped my hired, geared tank at stage 3 needed to use my owns, and that tank was higher level and more trained ten mines. Ofc that I used at Stage 1. 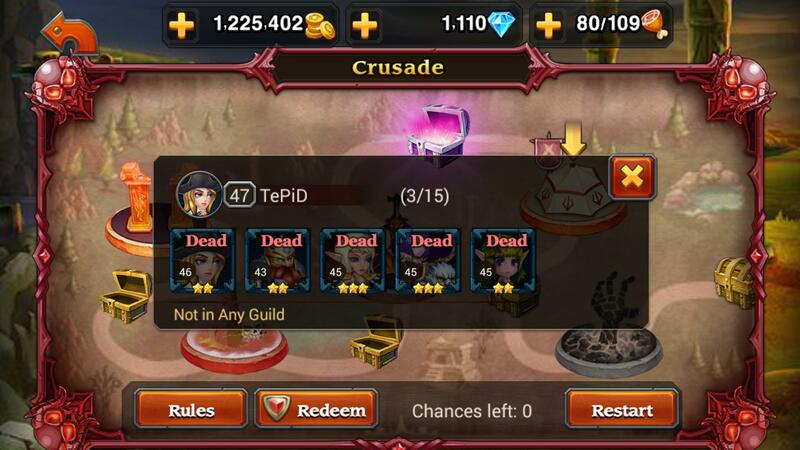 It could be just a bad luck, but previous days too couldn't go with the hired tank more than 3 stages. Could you check this and in case if you find it true update the guide please? Ofc I don't have DK and can't hire it from guild -and I am bored changing guilds. - if you click on hero you will see a hero list. -46 - 1943 - 2* - I don't use this in crusade, but other which has lower Power as number. Now from here it will calculate I have an average of 1995.5 power for lvl 46 x4. He will calculate the expected mercenary power of my team level: 50 , let be 2500 or even more? If I didn't hire a level 50 hero, because that wasn't a tank or it was an untrained or for any other reason I hired a lvl 48: I lost almost instantly the mercenary. - maybe they saw my thread "how to raise the team level gap between hero" and they "fixed" this hole. - I don't mind, but they has changed the formula. - also on the other accounts I met changes. Now I can't clear it, not even 11/15. I will adapt, if I will play, but with that account it was easy 15/15 until now. Last edited by heroeszabi; 11-09-2014 at 09:35 PM. 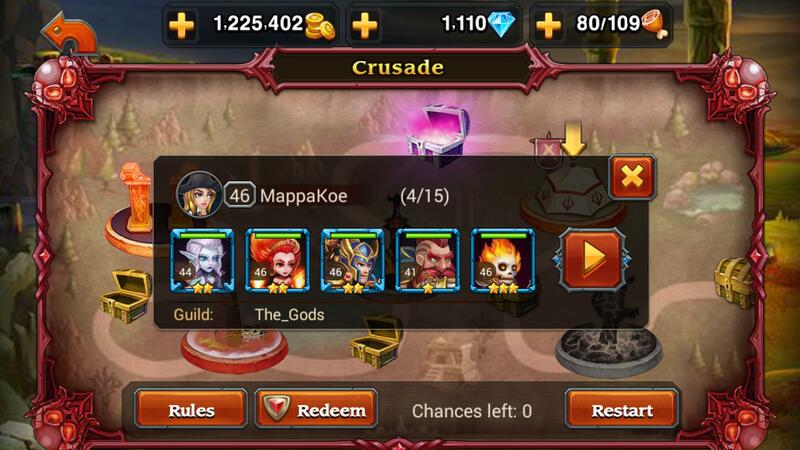 What hero i must pick for crusade(1st team 2nd team), arena, campaign? For Crusade, my axe and admiral cant tank until 15 stages now, I cant hire DK on my guild because my lvl doesnt meet the requirement. Clearly visible the second stage has a completely different algorithm matching. I don't know what takes on calc, but it can miss terribly. Stage 2/15 wiped 3 teams and the 4th team cleared it. If I would try it with the top ones it would be a wipe. I had no mercenary hired. -this cave drains all good heros and heroes level 1 are shared. Arena ranking it was around 700-900(and couldn't do even 7-8 stages), when I played active, now it is 6k. Last edited by heroeszabi; 11-13-2014 at 02:02 PM. Hi I need some help with the setup of my heroes and didnt wanted to open a new thread, so ill just ask here. My Team Level is 38 and im VIP 3. Which setups would you recommend me for Arena/Crusade/Campain? And which heroes should i focus on (thinking of late game for example)? Commando is prefered my of of the community and is easy to get the souls: he is good everywhere - almost. Get it to 3* from Crusade. 1 slot is solved. Soulhounter: is a frontline, usually nobody likes it. 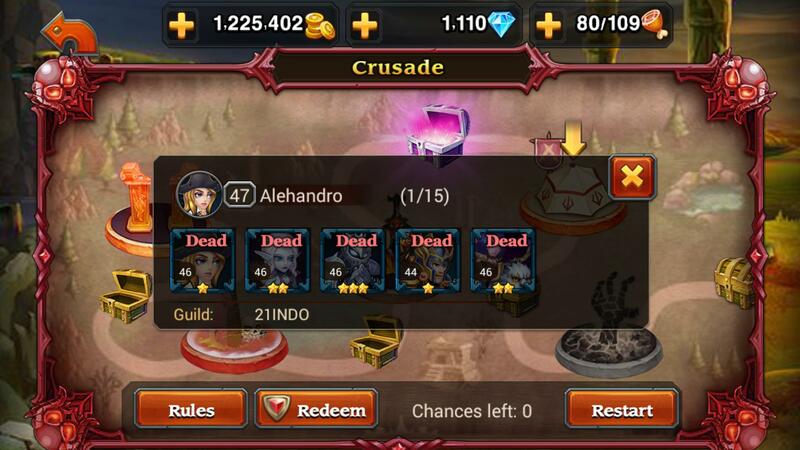 But it is at 3* and your Brute may die in Crusade, need a replacement... so I would level it and gear it, but not train to max just to 80% later will be replaced, altough I have seen somebody at Arena with him along WC, I did a Crusade with a hired Soulhunter and I loved it, it isn't popular and for sure it is a reason for that. - maybe not everyone get it from chests. Cleric+Admiral: I like both, but the community members hate Cleric they find useless. Admiral at higher level becomes strong ( 80 ) and from personal experience the 2* isn't a toilet paper like the 1* at this level! - so if you take to 2* than is ok, otherwise not: 1 map to farm. 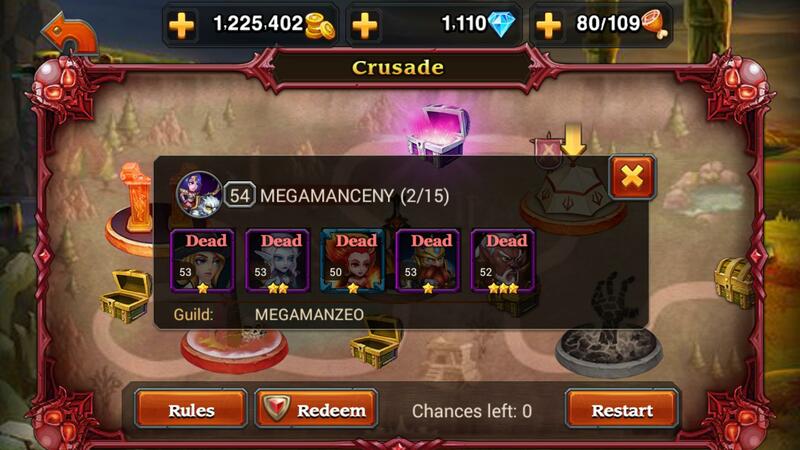 LM: not at Arena, because he is replaced with Old Curse, Vengeance and other Aoe dps with CC. At Crusade is fine, I like he is charged fast, but others are replacing. I have replaced me too him with Pilot, since is easier to farm the souls. Emberstar: I have seen at top arena with 3* and 4 * after the epic spell has fixed. At 1* is weak, at 2* at this level is nice (I have played with). Anyway he is a tank killer, not tricky, not CC, not fun, just hard dps. Wind Master: - because he is 3*. At crusade is fine, at Arena... depends, some preffer to spend the coins on commando instead. You should use it now, but not spend on his souls, since you need commando a lot more. Train it. Leaves Shadow: everybody likes, just me not. Slowly charges, hits hard, usually others are using at arena and not at Crusade. Easy to get 2*, I would get it. Chaplain: needed for crusade, need to farm his soul stones, as the war chief ones. - if you can't pass a stage just level up the hero set with 2-3 and add a new gear and you pass it. Ofc it help a good setup, but leveling many hero leads to other problems. Why are you staying and need to level just farm soul stones from elites and collect gears for next hero color, simple. Take the War Chief from Souls, Pilot 2*, Mystic 2* after Commando 3*. This is my opinion, others may differ! Last edited by heroeszabi; 11-13-2014 at 10:35 PM. I'd also like some team setup advice, i'm level 40 currently. I'm mainly interested in arena advice, would be great if you could give me a few different team composition options. I'd also appreciate advice for campaign too, feel free to give crusade advice but i currently go 15/15 pretty easily anyway. Prepare a war chief for your arena team after purple. Or if you want a double tank team, Savage,WC,OC,Commando,LS is a decent team too. Silencer is useful against magic heavy teams, but those get rarer as your level increases. Admiral is a great hero. Her Ghost Ship is uber useful as it can damage, stun, and disable units who are in the middle of casting ultis/spells unlike Cleric's useless immunity heal. Plus, I already have an Enchantress for healing my team and she can enchant an enemy unti to turn against it's team. Waay more useful than Cleric. Hello i'm new here and i think this guide rock! i'm playing on server 33 now level 43.. I'm now collecting ice mage (16/30), Old curse (15/30) to replace lightning elemental and pilot.. Also i'm collecting warchief (16/30) and planning on upgrading shallows keeper (16/20).. Am i on the right track? 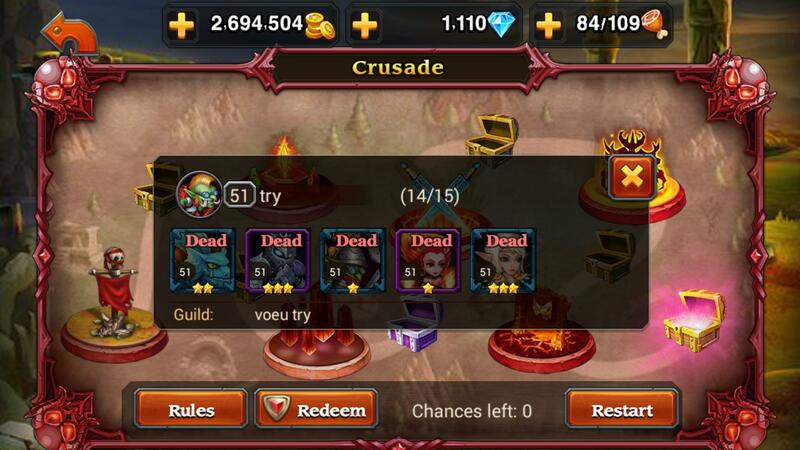 I can only beat crusade 1 of 5 try yesterday using death knight mercenary but mostly i'm stopped at 12-14.. Any suggestion for crusade line up for my team? Thx before guys..
Psychopath , Succubus , Commando, Wind Master , ??? at 50+ im using War Chief or could i use it right now? should i change my setup? Last edited by FirstPirate; 11-17-2014 at 02:56 PM. My main team is the first 5 heores of the list. I've saved actually 2335 gems to roll 10 purple chests. Farming Crusade for Wind Master, 30 stones away from her. First of all thanks a lot to Cappuccinomans for creating this guide. It's really helpfull for begginers ( its a shame I discovered now ). I must be the weakest player in my server. Im lvl 36, and I have only 7 heroes. 1. Admiral 36. Blue +1. Main Skill lvl 35. Green Skill lvl 21. Blue Skill lvl 3. 2. Shallows Keeper 32. Blue. Main Skill lvl 11. Green Skill lvl 4. Blue Skill lvl 1. 1. Ember Star 36. Blue +1. Main Skill lvl 20. Green Skill lvl 8. Blue Skill lvl 1. 2. Lightning Master 36. Blue +1. Main Skill lvl 20. Green Skill lvl 10. Blue Skill lvl 1. 1. Chaplain 36. Blue +1. Main Skill lvl 20. Green Skill lvl 8. Blue Skill lvl 8. 2. Leaves Shadow 36. Blue +1. Main Skill lvl 20. Green Skill lvl 8. Blue Skill lvl 8. 3. Professional Killer 36. Blue. Main Skill lvl 11. Green Skill lvl . Blue Skill lvl 1. That's my team. Can you help me a little bit? I would appreciate any help, for example: "Dont waste any good in this hero, or improvi this hero untill lvl X, or something like that". BTW, I can't win in arena. Should I play vs more ranged people? or vs more leveled people?